Rolling through the water as steady as a rock! The T.A.P. Fin System gives this fisherman an extra edge. 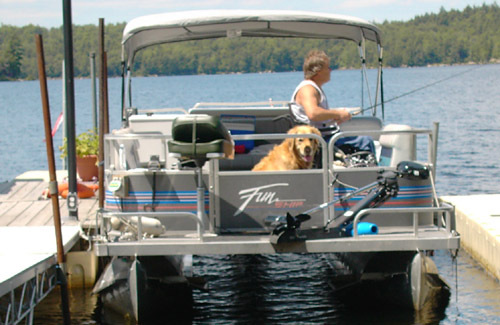 I have made numerous changes on my pontoon boat (1991 Grumman 24′ with Honda 90HP 4stroke) over the years to make it more wheelchair/fishing friendly. The large bench seats were removed and replaced with the shorter lounge seats. This way I can fish from the front sides of the boat whereas before I was limited to fishing sitting between the bench seat and console. I replaced the 4 bow square tube bimini top with a lighter/shorter 3 bow bimini that I can easily raise and lower myself. The shorter height also keeps you dry. ( I wish someone would make a telescoping frame for these tops. The high tops are useless in a rain storm.) I use a motorguide trolling motor with the Servo Positioning Steering foot pad which can be operated by hand very easily. I removed the privacy curtain and placed a chest of waterproof drawers in the compartment to make up for some of the storage space lost from the removal of the bench seats. The prop guard has made it much easier to dock, especially in windy weather. I made other small adjustments over the last 14 years to make this old boat as wheelchair friendly as possible. This year I added the T.A.P. Fins and its one of the best additions made to date. Boating in rough water can be a painful ordeal when you’ve had a serious back injury. I have been using a wheelchair for over 30 years and back pain can be excruciating after a windy day on the lake. These fins have made an incredible difference on how the boat rides on rough water. The boat seems to glide over the waves instead of bouncing over one then plowing through the next. WOT on big waves is a kick! I also noticed a much drier ride , better mileage and improvement in top end but its the smooth ride that I appreciate most. I did have a concern with being able to park close enough to the dock to wheel on and off but as you can see in the photos, its not an issue. I originally considered the waterglide but was told it would make a pontoon boat ride more like a v-hull? A third pontoon was another option but I was concerned about sitting too high in the water when fishing. If the deck was any higher off the water it would be very difficult to net a fish. Also, the higher profile of tri-toons make them difficult to dock in windy conditions. My pontoons are 23″ so with the TAP fins I get to keep the low profile.